If you are looking for some solid inspiration to start your take at the masterpieces of contemporary art paintings, here’s our catch for you. We have chosen this list of Masterpieces of Contemporary Art Paintings Beginners must try, to make set his hand at it. 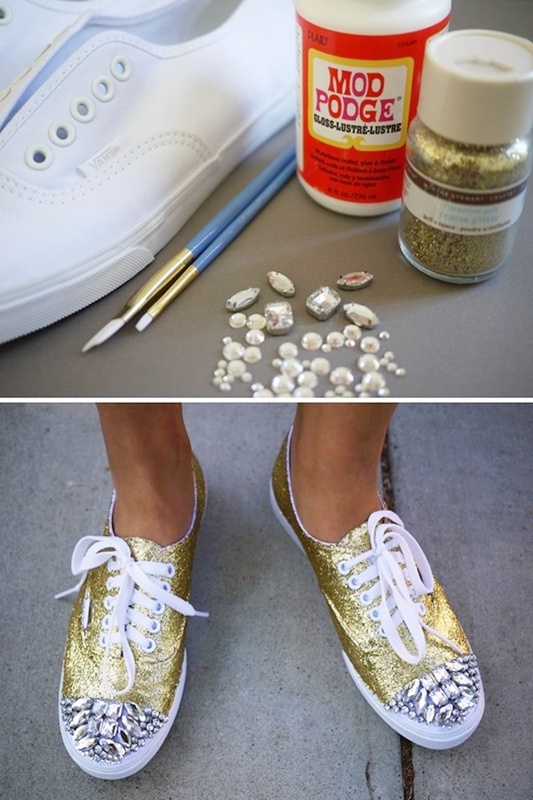 Red or green or silver glitter can make your sneakers look party-ready. Just be neat with your work to make sure they don’t appear messy after they are done. 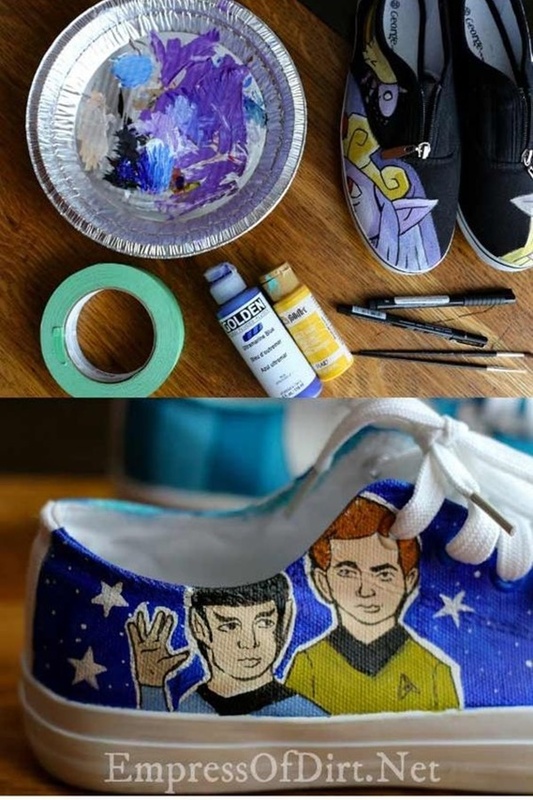 The galaxy on shoes might sound absurd. But that’s what the recent sneaker upcycling trend is all about. 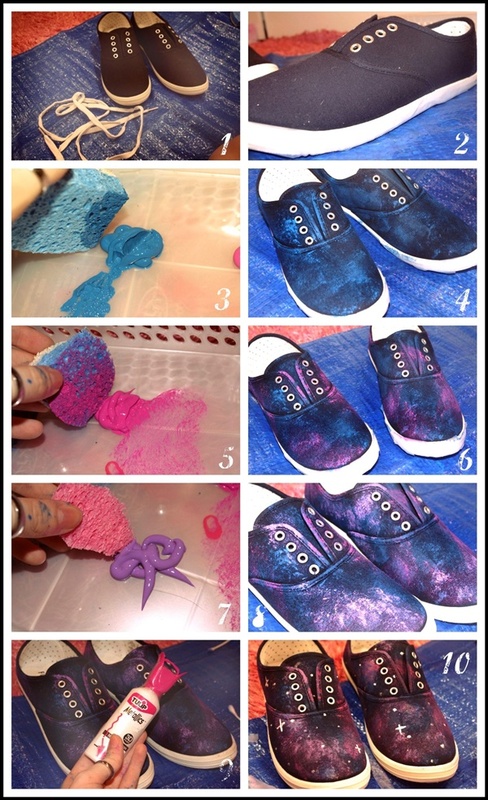 So, all you have to do is paint the galaxy on your sneakers for an extra-terrestrial effect and you are good to go. Just be precise with your work. Do you have bits of fabric lying in your workshop? 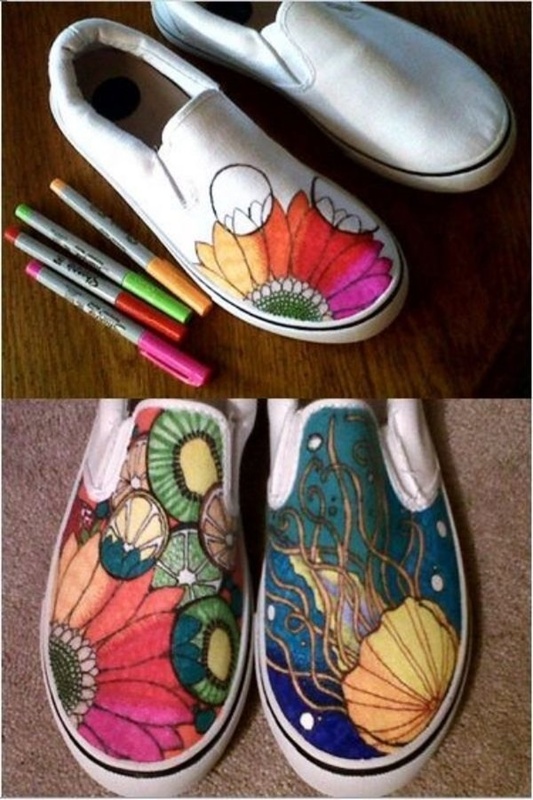 If yes, don’t throw them away; just use them to decorate your shoes. 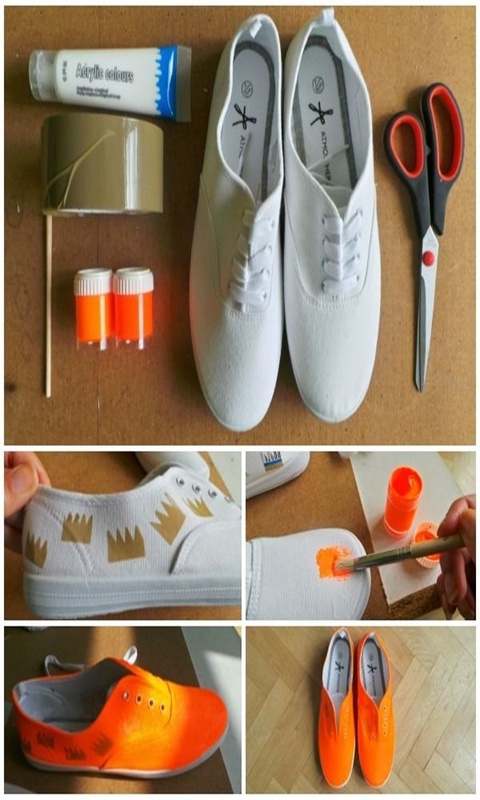 All you need is a pair of scissors and a good-quality adhesive to stick the fabric on the shoes appropriately. Planning is a must here- as once pasted, the cloth patches are hard to remove. Love doodling? 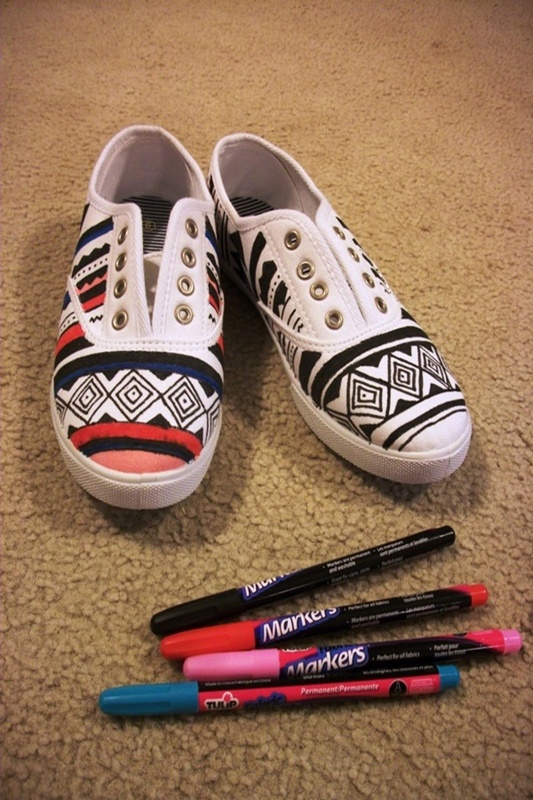 Use your sneakers as your canvas. 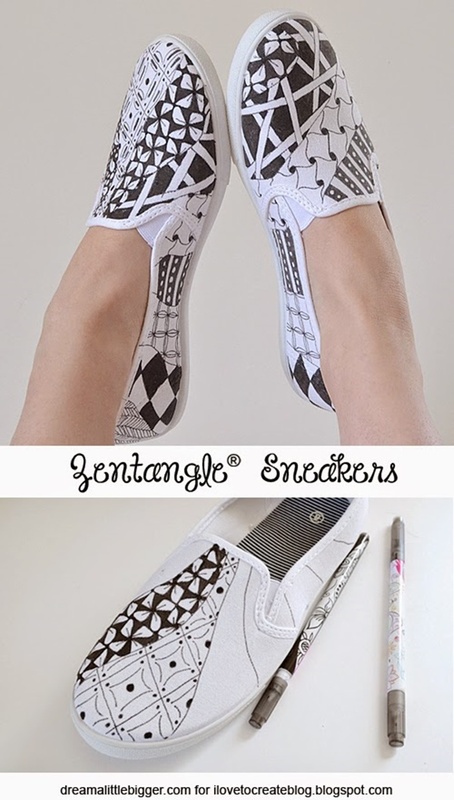 Go crazy with your imagination and fill every corner of the shoe surface doodling away. Although you’ve got to do this mindlessly, being a little conscious about aesthetics won’t really hurt you. Also, here are some Creative Doodle Art Ideas to Practice in Free Time. Tribal art is a popular art form. And we have begun to see it on numerous platforms. 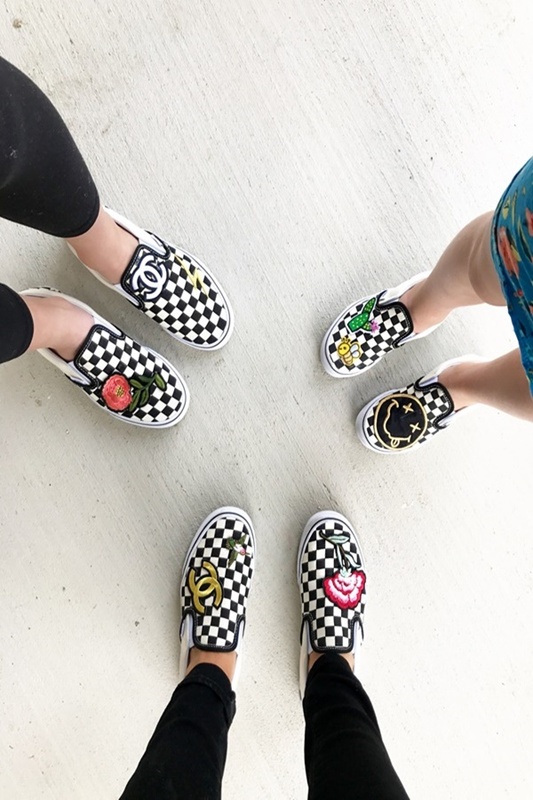 Yes, canvases and monuments are some of the most important places where we see this art, but you can make it much more interesting by trying it out on your favorite sneakers. 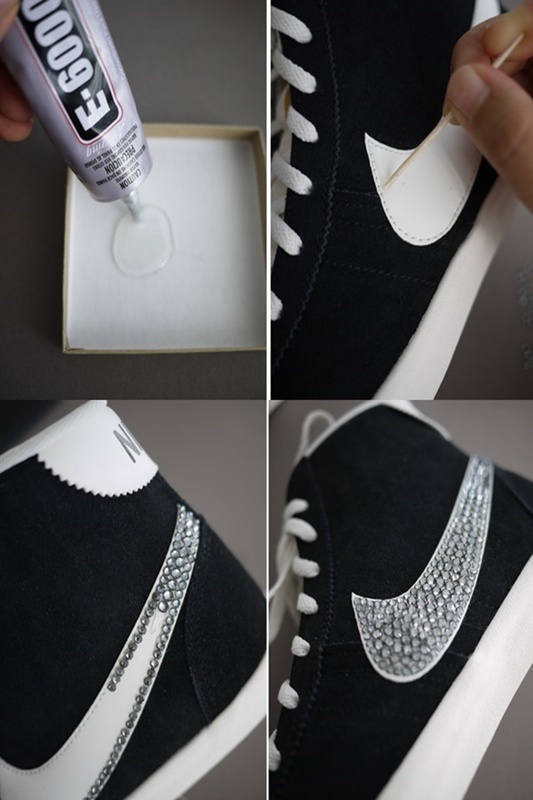 Do you want to add a little bit of bling to your sneakers? 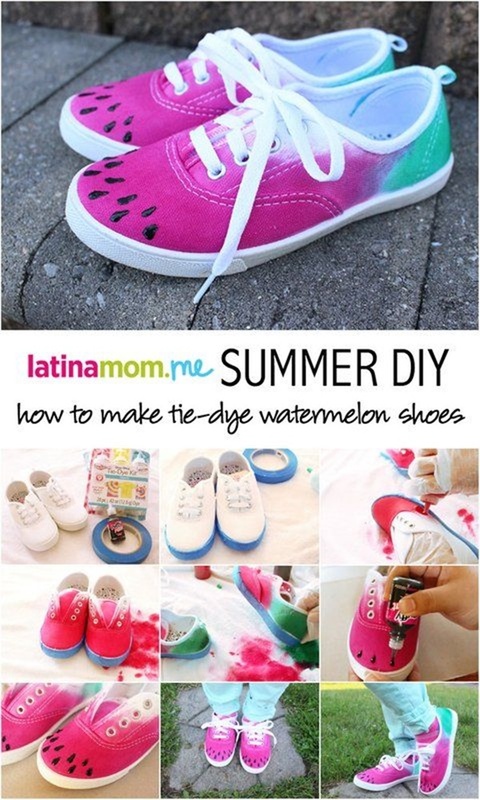 If yes, then it would be wise of you to decorate your shoes with rhinestones. 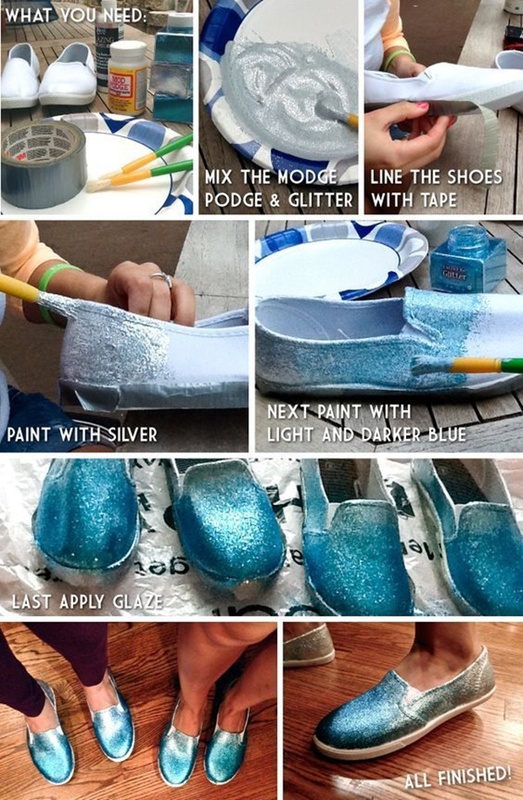 Rhinestones ooze out a diamond-like effect and are popular as a DIY project essential. Plan out a great design and try to create it with rhinestones. There is nothing more fun to do than this. Embroidered fabrics were, are and will be popular. But have you ever seen embroidered shoes? Well, they are not too uncommon. And if you have really seen such shoes before, then there is no reason why you should not like them. They are blingy, bright and everything that would make you feel party-ready. 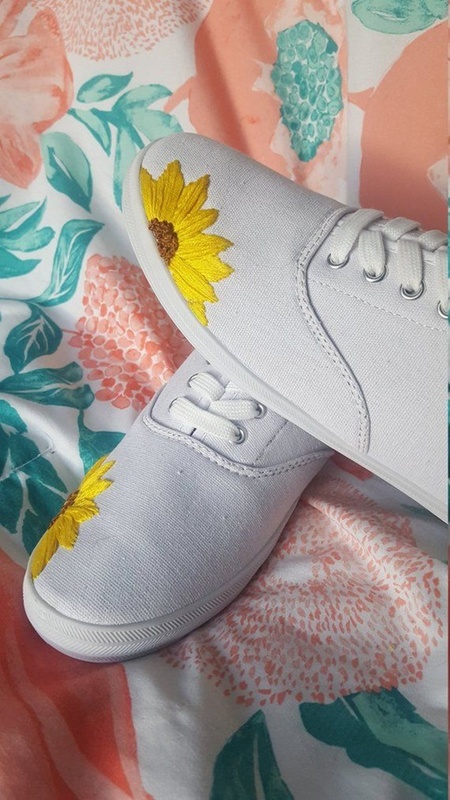 Thankfully, you won’t have to invest in a new pair of embroidered shoes for this new look, you can do the embroidery on an old pair of shoes for some fun-filled style. It should be well decorated so that you can lounge and create some beautiful memories. And to help you out, here we’ll be sharing DIY wall stencil designs to add soul to your home. 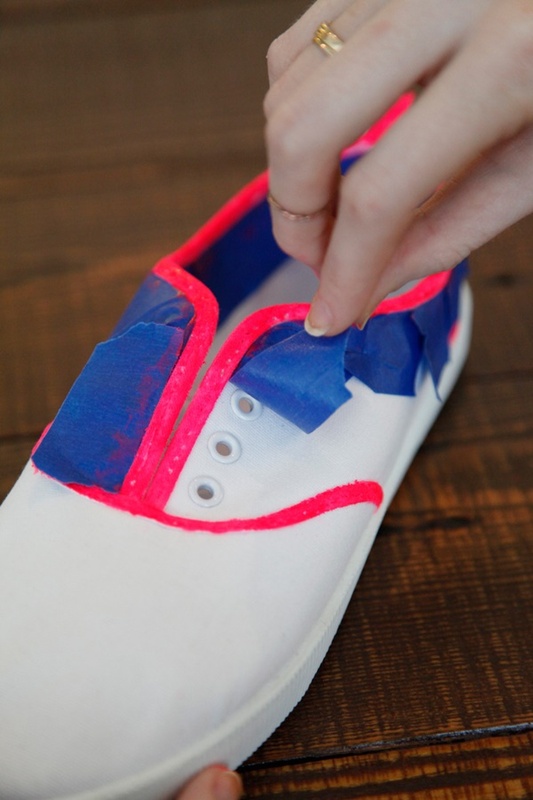 Your sneakers won’t be boring even if you try out this DIY shoe upgradation technique, so, what you need to do here is gather a few fabric stickers. 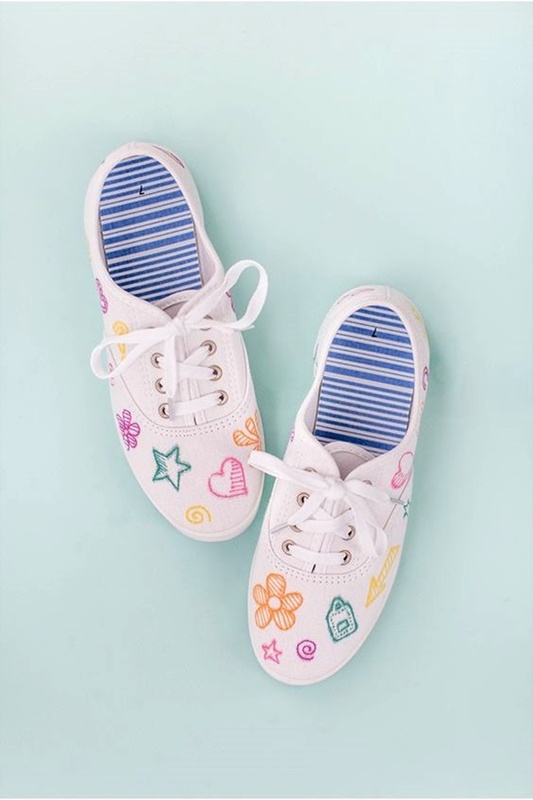 You can get smileys, kiss symbols, and other cool stickers and then stick them on your sneakers. 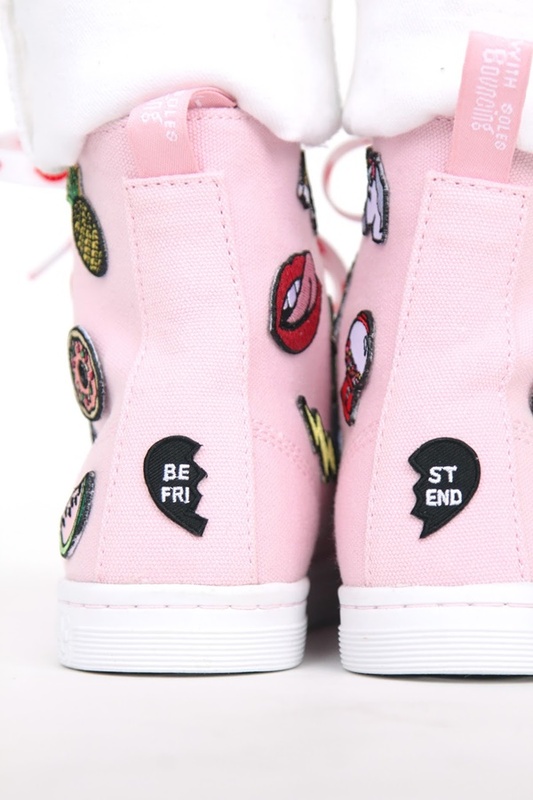 These patches offer your shoes a teenage-ish look. A lot of youngsters are fond of buttons. 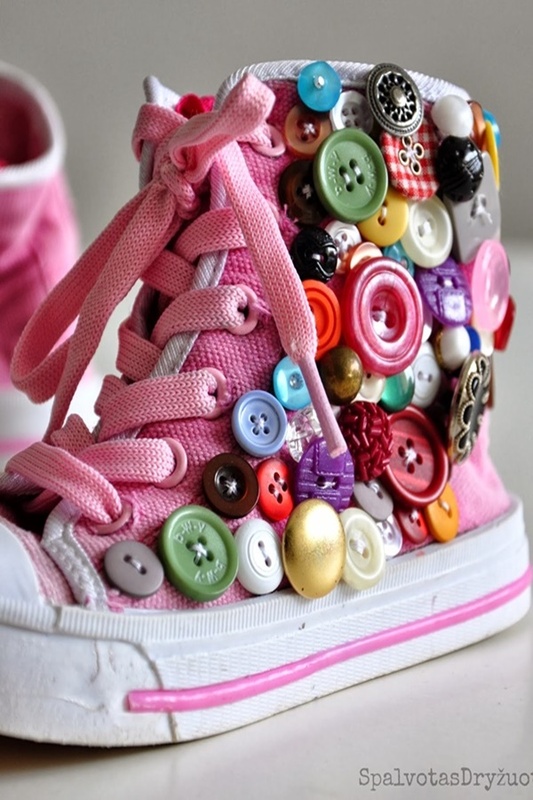 If you too have a special fondness for buttons, then you can try out this shoes revamping art. 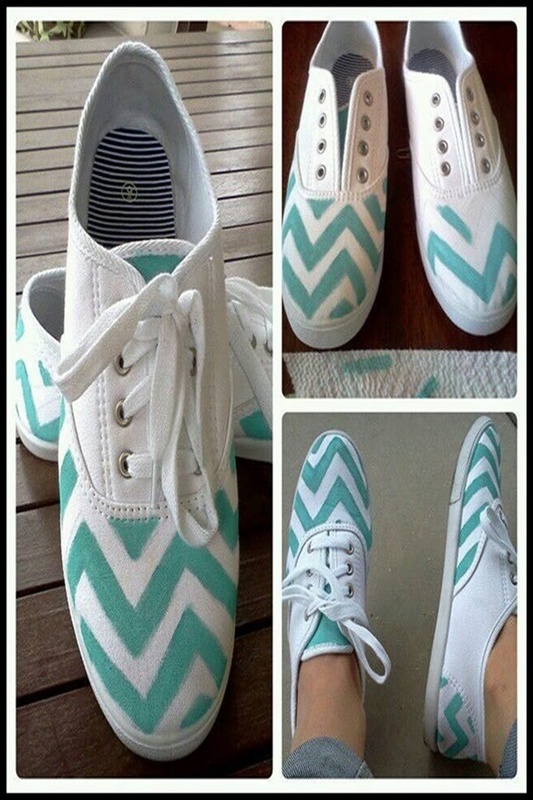 In this project, you will need a pair of plain sneakers, and then you will need a couple of buttons. 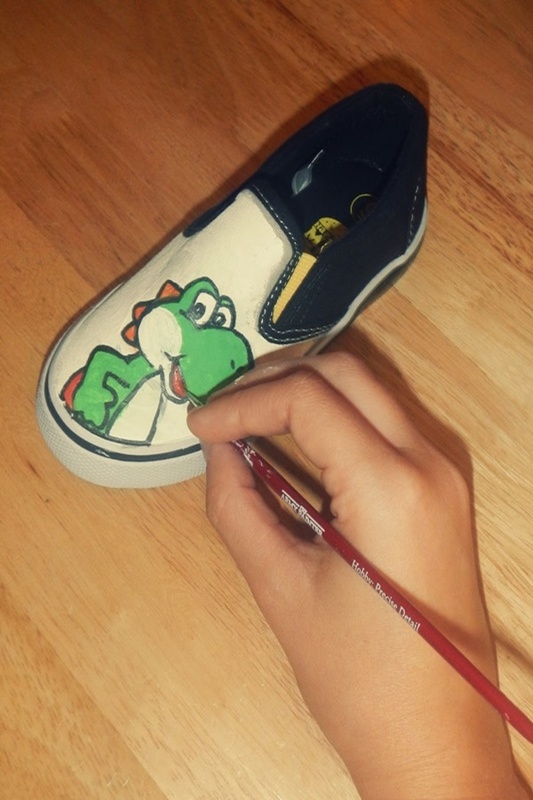 Now, the buttons are to be glued to the shoes in such a way that they together create style. Whether you use single colored buttons or multicolored ones- the end result is going to be awesome. 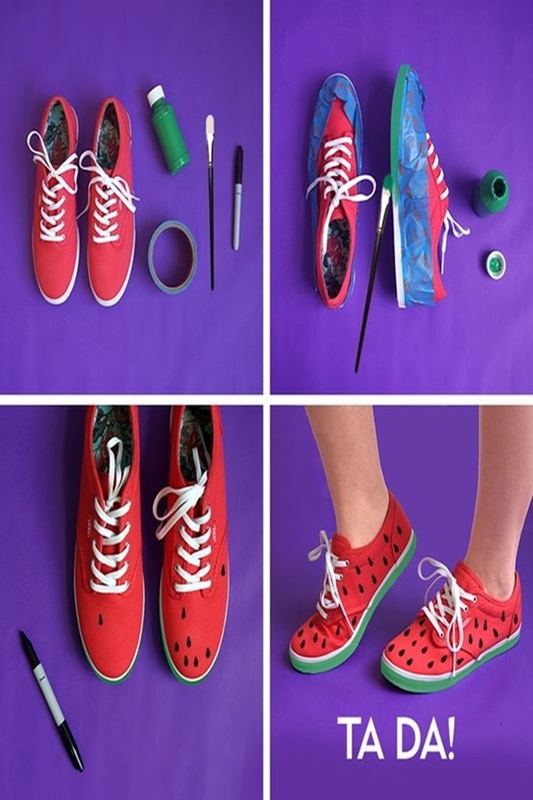 Is it worth upgrading your sneakers using all the above Sneaker Upcycling Ideas? 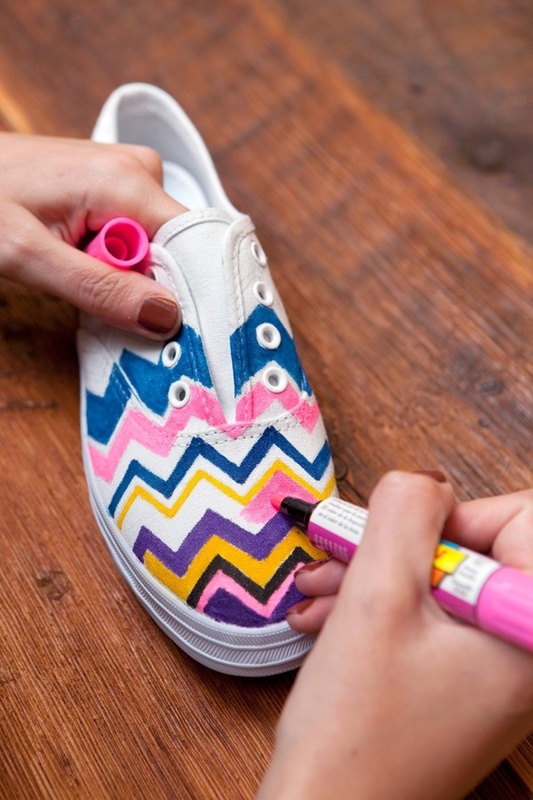 The DIY Sneaker art Ideas to Look Awesome are popular, without a doubt. And the reason is that a lot of people consider plain to be boring. If you really want your sneakers to be a subject of interest for people, then knowing How to upgrade your Old sneakers is important. 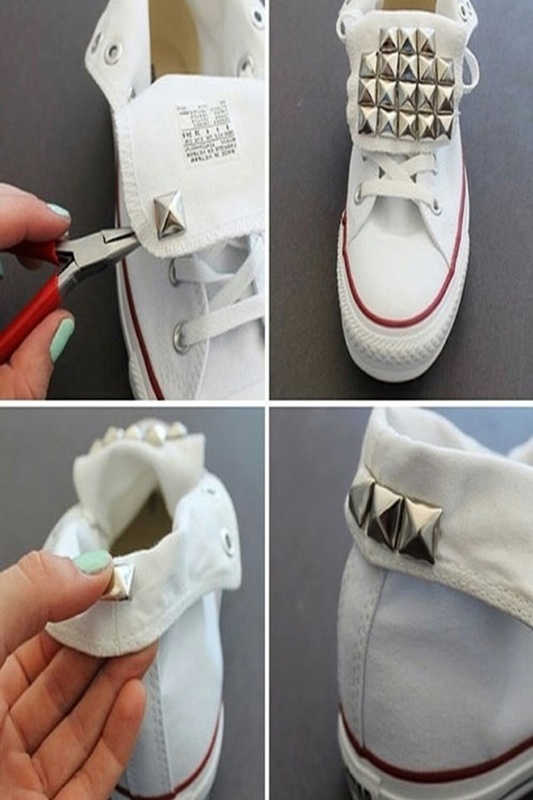 Are Sneaker Upcycling Ideas expensive? Well, it depends! 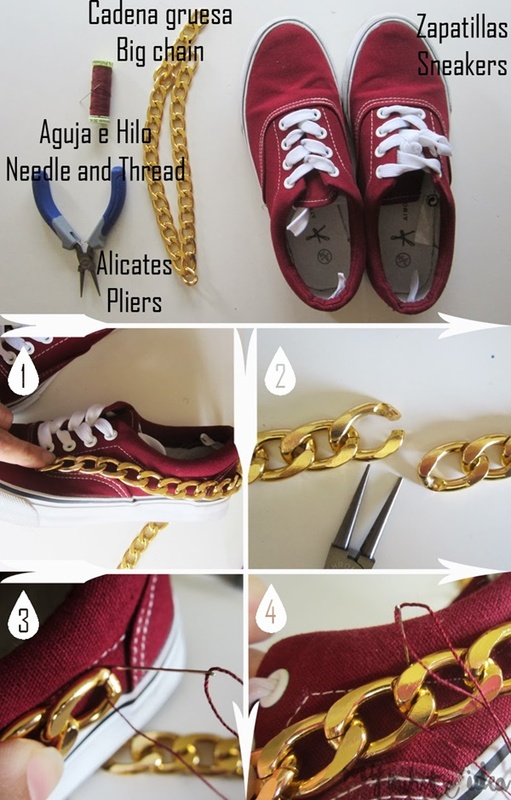 If you know How to upgrade your Old sneakers in a cost-effective manner, then this exercise will sure not burn big holes in your pocket. 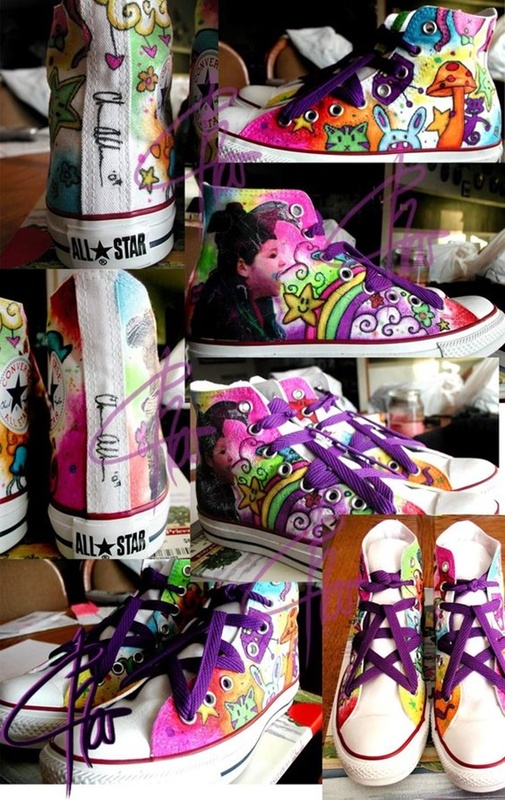 But in case, you go for expensive DIY Sneaker art Ideas to Look Awesome, then price economy won’t be possible for you. For instance, you can’t expect to maintain the financial economy by decorating your shoes with expensive stones or diamonds. 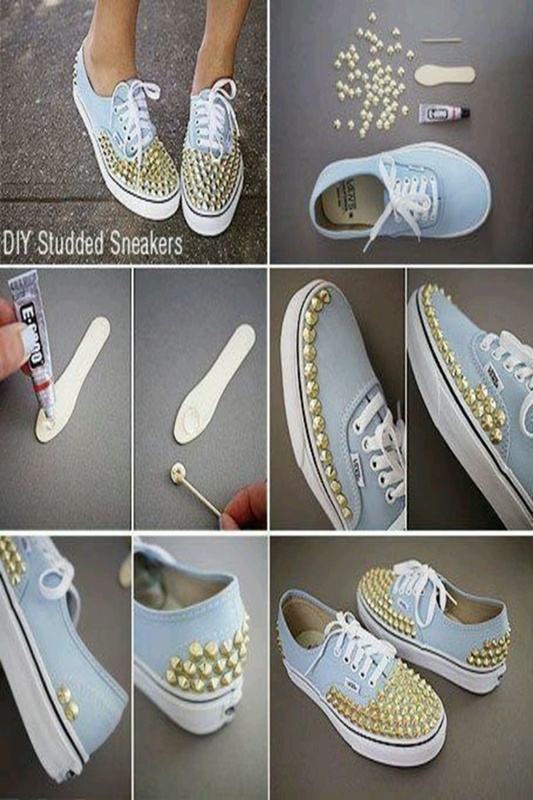 You can use rhinestones for the same effect without spending a lot. 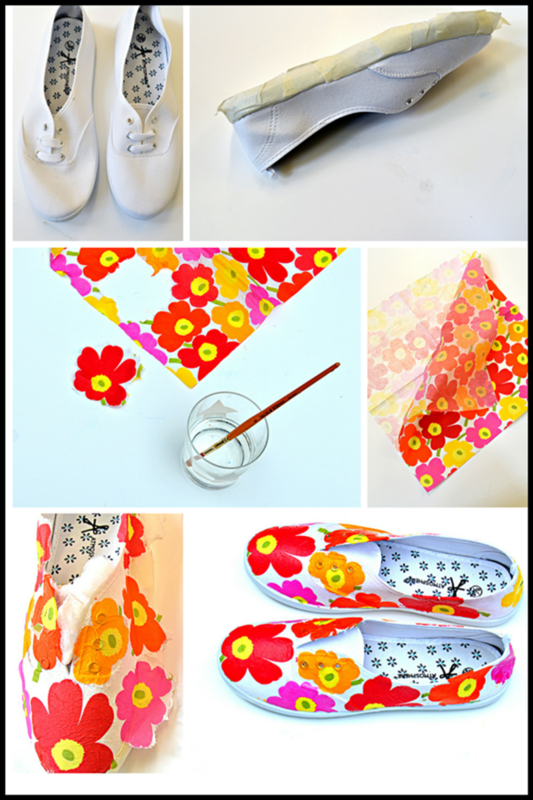 Here we have compiled for you a list of some wonderful Raining Umbrella painting ideas for your cute and loved umbrella. Your sneakers are your best friend for sure. And you don’t like to miss any chance to upgrade them. 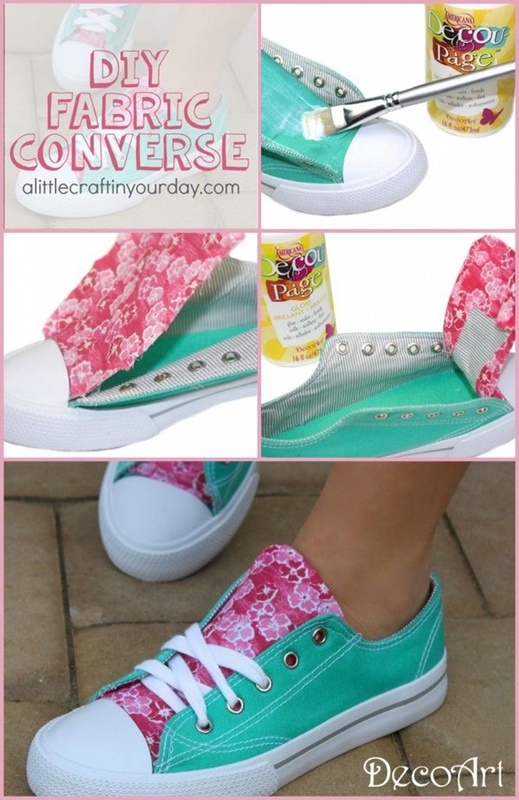 The above Sneaker Upcycling Ideas are also appropriate for people who are sick and tired of wearing plain boring sneakers. 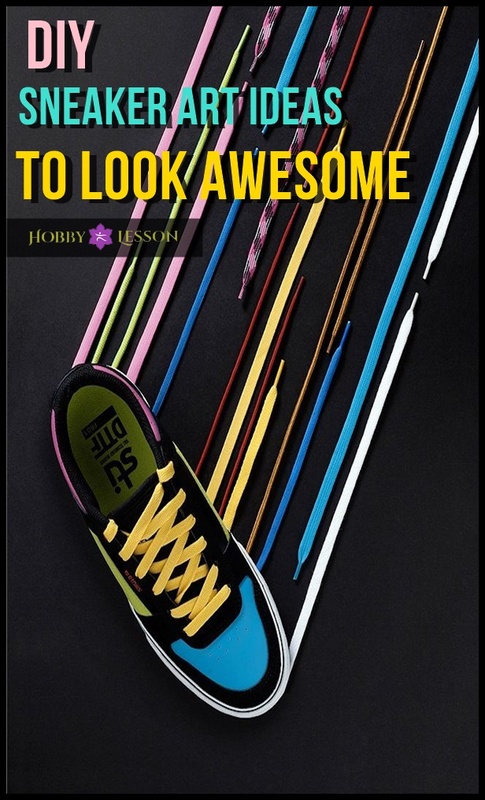 With some knowledge on How to upgrade your Old sneakers, you will definitely be able to make your style stand out. 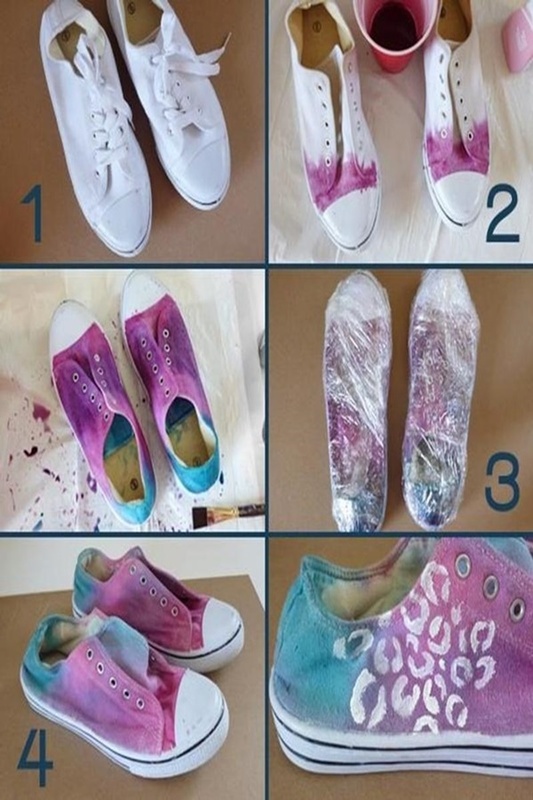 So, follow the above DIY Sneaker art Ideas to Look Awesome!